When this piece came to The Center for treatment, we knew it was only a matter of time until we discovered the story behind it. After several conversations with the owner followed by some research on our end, we discovered that the clock was designed by Irving Harper for the “Motion Notion” series in 1959-1960. The owner added, "when the clock is functional, the blue and white patterned background revolves, with the speed of the second hand. That gives the clock line its name "Motion Notion"." Often referred to as the “Compass Clock”, the timepiece was produced by George Nelson & Associates, where Harper worked as a designer for nearly seventeen years. During Harper’s tenure at George Nelson & Associates, he designed everything from the still-iconic Herman Miller logo in 1947 to the famous Marshmallow Sofa in 1954. When he was given the responsibility of handling the Howard Miller Clock Company account, in true Harper fashion the result was anything but ordinary. Numbers were omitted from designs, and what were once purely functional objects were transformed into pieces of sculpture. Even in its pre-treatment condition, our client’s “Compass Clock” offered a beautiful example of this innovative style. When the piece came to The Center, it was covered in a light layer of dust and grime. There were abrasions, dirt, and orange stain spots throughout the work. There were two bent posts and scattered dents throughout the surface and outer housing. There were scattered losses to the polychromy around the frame of the clock, the center shaft was slightly bent, and the minute arbor was damaged. The clock design featured strands of monofilament, or man-made fibers that resemble a fishing line. Some of these monofilaments were damaged and broken. The backplate of the clock was missing entirely, but surprisingly the timepiece ran when plugged in. After his initial examination and testing, our conservator began treatment by carefully taking apart the elements of the piece in preparation for cleaning. After the pieces were carefully cleaned using the appropriate conservation materials, the dents were repaired, the bent posts were straightened, and selected areas were filled and sanded. Next, our conservator airbrushed his repairs with acrylic paints. Abrasions on the black posts were inpainted with PVA paints, and the damaged monofilaments were replaced with new 20lb monofilaments. The new monofilaments were then toned to resemble the appropriate aged appearance and the clock was reassembled. When Harper died at age 99, he was described by some as “the greatest American designer most people have never heard of”. During Harper’s time at George Nelson Associates, most of his designs were attributed to George Nelson, as this was the company’s practice. Harper would later leave George Nelson Associates to begin his own firm. Irving Harper in his New York home, Image courtesy of Why Magazine and Herman Miller. Throughout his career as a designer, Harper was known to build paper prototypes for complicated projects. At home, he began creating paper sculptures to help relieve stress. This became a hobby that followed him into retirement, leaving him surrounded by hundreds of sculptures in his Rye, New York house and barn. 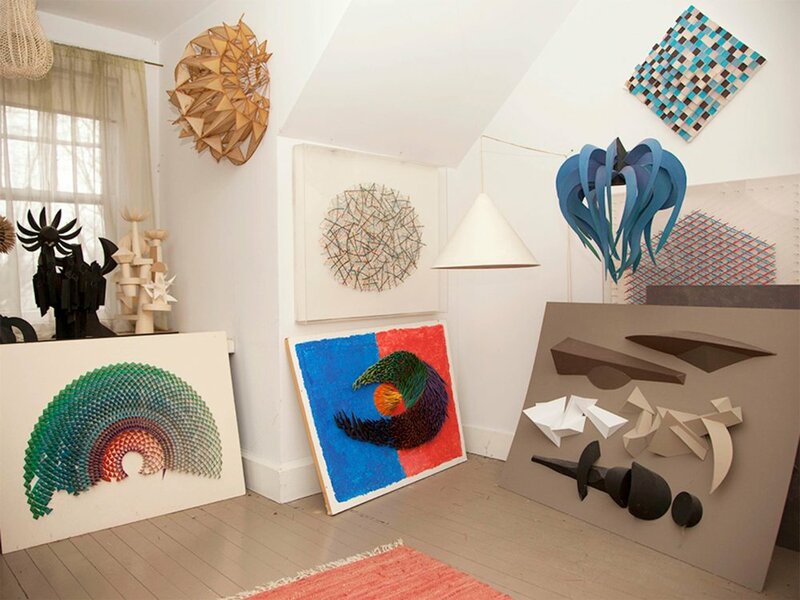 Irving Harper's New York home, Image courtesy of Why Magazine and Herman Miller. Harper was formally trained as an architect, and his work pays homage to this. Clean cuts and curved lines form whimsical constructions that offer viewers a satisfying map to explore. Precision and talent meet a level of childlike creativity. Harper’s paper collection remained untouched until his 2015 death; he refused to sell the works during his lifetime, and instead preferred a more private creative practice that employed simple materials such as cardboard and Elmer’s glue. Whether his paper sculptures or clock designs, Harper’s work proved enchanting throughout his career. Our client has collected close to a dozen pieces from both these periods of Harper’s life, recognizing “the personal vision of the paper sculptures". He acquired the majority of his sculptures from the Wright auction house in 2016, shortly after Harper’s death in 2015. The results of Harper's career are approachable pieces that demand as much or as little investigation as viewers are willing to offer. His Compass Clock ticks as tribute to this.